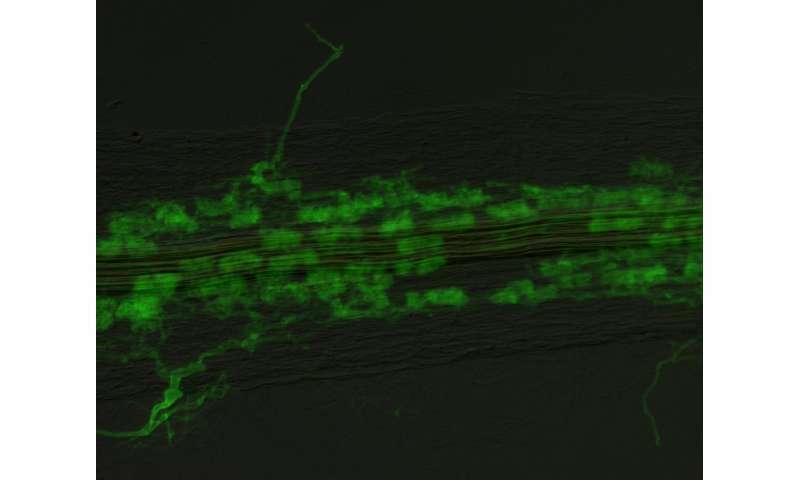 Taking a much closer look inside root cortical cells, you will find dynamic, branching fungal structures called arbuscules where the two organisms can exchange their goods. "Each root cell builds a special compartment surrounded by a membrane to house the arbuscule. Within this compartment, the arbuscule first develops and then dies, a process referred to as degeneration. As the arbuscule degenerates, the plant disassembles the compartment and the remnants of the fungus," explains Dr. Maria Harrison of the Boyce Thompson Institute. "The regulation of arbuscule lifespan through arbuscule degeneration has likely contributed to the stability of the symbiosis because it prevents the persistence of fungi that do not deliver phosphate" stated Harrison. "The research described in this paper provides the first insights into the molecular basis of a degeneration program and the transcriptional regulators that control it." The main obstacle to investigating molecular mechanisms of arbuscule degeneration lies in the dynamic nature of the interaction - within a root system, arbuscules exist in all stages of development and degeneration, making it impossible to isolate only one stage. The authors solved this dilemma by using a mutated version of the leguminous shrub Medicago truncatula in which nearly all arbuscules are in a degenerating state due to their inability to transfer phosphate to the plant. Working with the mutant roots, the researchers were able to identify a transcription factor, called MYB1, that seemed to be driving this increase in arbuscule degeneration. They confirmed their suspicion by showing that MYB1 is necessary for the expression of several genes associated with arbuscule disassembly. Furthermore, increasing MYB1 levels in wild type Medicago roots severely impaired the fungus' ability to form healthy arbuscules. Taken together, these findings strongly support the idea that MYB1 could be a key to booting the fungus when it's not giving up the goods. "Regulation of arbuscule lifespan may provide an avenue for obtaining more effective symbiosis," proposed Harrison. Effectiveness of arbuscular mycorrhizal symbiosis is typically measured by how much phosphate the fungus is able to transfer to the plant, especially when considering crop species that may require fertilizers. "If you can extend arbuscule lifespan slightly, possibly by modifying when the degeneration program is triggered, then there is time for additional [phosphate] delivery." First author Dr. Daniela Floss added, "The knowledge that we gain through investigating the molecular mechanism underlying AM symbiosis will help discover products that specifically target a protein or mechanism to make the symbiosis more efficient."